The Machine of Death started as an idea in Dinosaur Comics. Imagine a machine that tells you how you’re going to die. Its predictions are never wrong, but they are also never straightforward. So a prediction of MODERN MEDICINE means a drug overdose. PUMP MALFUNCTION? Heart attack. You can spend your whole life trying to avoid your death, but the machine’s prediction is always right in the end. This is How You Die is the second collection of short stories based on this premise, and it’s brilliant, scary, hilarious, and a lot of fun to read. Each story takes the idea of a machine that predicts your death, and runs with it in a different direction. What if kids collect cause of death cards, and some friends decide to try and get themselves a very special card? What if a serial killer uses the machine to find his next victim? What if we put everyone who is going to die from AIDS in a compound, to protect the rest of society? How would the machine be received in India, where there already is a popular business in forecasting the future? What if a far future society uncovered the machine, and completely misunderstood what it does? All these stories are in here, and more. There’s a Sherlock Holmes story. There’s a sword and sorcery tale about an orc and his sorcerer master. There’s a choose your own adventure story. There’s a storybook devised by the Department of Homeland Security, in order to introduce children to the machine. There are even two stories on how the machine works. One of them, “Monsters from the Deep” by David Malki !, is particularly terrifying. But one of my favourite stories is Ryan North’s “Cancer”, which imagines a way the machine could help treat cancer. But more importantly, it’s a very affecting, personal story. ‘Nathan Burgoine’s “Old Age, Surrounded by Loved Ones” is a very powerful story that imagines how you might be able to influence your fate. Other stories that stand out for me are the amusing “Lazarus Reactor Fission Sequence” by Tom Francis, about how the machine has changed the life of a supervillain, and Marleigh Norton’s “Two One Six”, which does something completely unexpected with the premise. In Grace Seybold’s “Drowning Burning Falling Flying”, aliens visit earth and the machine doesn’t work for them, and this could completely change life on earth. “La Mort d’un Roturier” by Martin Livings makes the machine a Jacquet-Droz automaton in pre-revolutionary France. “In Sleep” by Ren Warom puts the machine in an alien world where destiny can be manipulated. 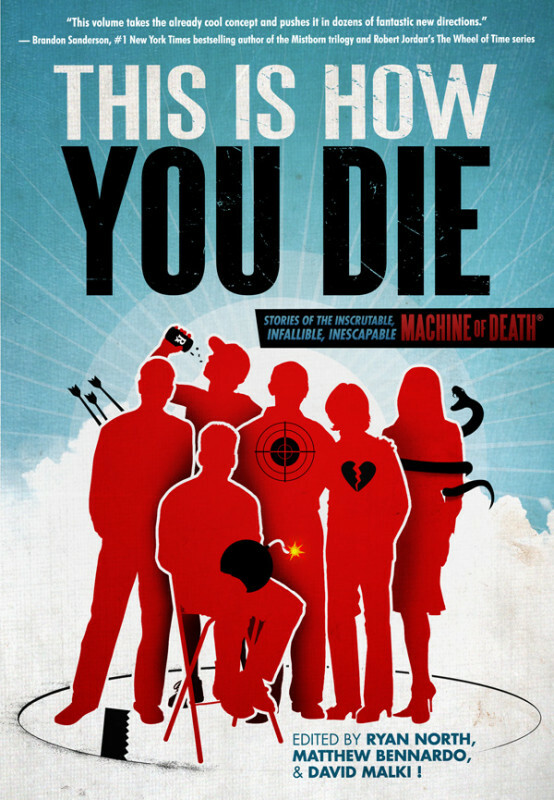 This is How You Die is much better than the first collection, Machine of Death. That collection had a few really good stories, but too many of them were retreads of the same theme: character gets death prediction, and wonders what it means. Most of the stories didn’t do anything imaginative with the premise, in other words. (But it bumped Glenn Beck off the number one spot, so there’s that.) For this new collection, the editors (Ryan North of Dinosaur Comics, writer and editor Matthew Bennardo, and Wondermark’s David Malki !) have chosen stories that really do take the idea in different directions, and for this reason it’s a worthwhile short story collection on its own merits.